The 220,000-square-foot T3 office building in Minneapolis, Minn., with a design led by B.C.’s Michael Green Architecture and StructureCraft, will soon be home to an Amazon. The future smells like spruce. I'm on the third floor of T3, an innovative office building that will soon be home to an Amazon, but the familiar whiff of wood is everywhere, oozing from the brawny beams and knotty softwood decking that support the floor above. This 220,000-square-foot structure in Minneapolis, its design led by British Columbia's Michael Green Architecture and StructureCraft, will house tenants seeking the latest in office space. Here, that means glue-laminated beams and nail-laminated timber floors. It means wood. "It's changing the paradigm of what the future of office buildings might look like," says Michael Green, its lead architect. In Canada, T3 has plenty of company. A set of new wood technologies known as "mass timber" is being used to create buildings that are big and unprecedentedly tall. An 18-storey residence at the University of British Columbia is now the tallest building in the world with a primarily wood structure; a 13-storey condo in Quebec City will soon join it. A 12-storey building is in the works at a Toronto college. Sidewalk Labs, the Google sister company, has said it's interested in exploring mass timber in its Toronto development. These projects are signs of an architectural revolution. In many settings, timber is becoming cost competitive with concrete and steel; it is beautiful; and it is more sustainable than those energy-intensive materials. For the construction industry and for forest-rich Canada, this could be a big deal. "The potential for our economy is enormous," says Lucas Epp, an engineer who worked on T3. "We're just beginning to figure out the possibilities." "It's a really beautiful system – no glue, no nails," Epp says. "These can be cut on any angle, and the face of the panels can be detailed in a lot of different ways." In Canada, the T3 building has plenty of company. A set of new wood technologies known as ‘mass timber’ is being used to create structures that are big and unprecedentedly tall. These bespoke projects represent one stream of mass timber design, where the wood is carefully detailed and often visible in the finished building. But there are costs, in mass and money, to building this way. Both in T3 and at the Toronto building, the timber structure that's exposed has been made uncommonly thick; each beam has an extra band of wood three inches thick. In the event of a major fire, this extra wood will char, and the beam will retain its strength for hours – long enough to ensure safety. This allows the buildings to meet fire regulations in their local building codes. But it's expensive. In T3, the timber structure that’s exposed is uncommonly thick. In the event of a major fire, this extra wood will char, and the beam will retain its strength for hours. You won't see the wood. This doesn't bother the architects, though. Russell Acton, partner at Acton Ostry, argues that the building is not a showpiece. While it was spurred by federal research money geared to tall wood, that fact is not expressed in the architecture. "It's a background building," he says. "And we were happy to do what made sense." The project succeeded in employing wood structure, which allowed the tower to go up on site in a blazingly fast 70 days; but covering up the wood reduced the volume and expense of wood on site. "You save a huge amount of money that way," he says. 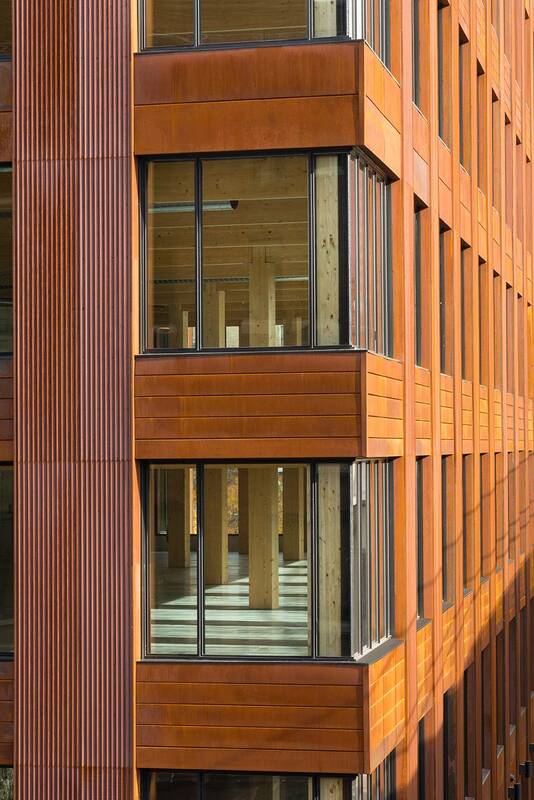 With projects like T3, the wood is carefully detailed and often visible in the finished building. And that, he argues, is crucial to playing out wood's sustainability benefits. These are substantial: In short, concrete and steel each are heavily energy-intensive, from the quarrying and mining of the underlying materials through the cooking of cement and the forging of steel. Wood's carbon footprint, according to the U.S. Green Building Council, is one-quarter that of steel. Wood absorbs carbon, and holds it until the wood decomposes or burns. So, Acton asks, "How do we get a lot of mass wood built? It's not by designing at high budgets. It's by creating something that the average developer will do for hotels and apartment buildings – something that's attractive in financial terms." For the Canadian forestry industry, this new market is enticing. Building-code changes in some provinces (including British Columbia and Ontario) make wood legal in buildings up to six storeys tall, and the 2020 National Building Code of Canada could push that to 12 storeys. "There will be both a domestic and a global market for Canadian engineered wood," says Derek Nighbor, CEO of the Forest Products Association of Canada. "There's an opportunity not only to build cool things, but to do so in a sustainable way and meet climate-change commitments." Governments are well aware of the possibilities. In early October, Federal Minister of Natural Resources Jim Carr announced a program to subsidize the design of tall wood buildings such as Brock Commons. "It's clear to us that mass wood is a cleaner, faster system that will have so many advantages," Acton says. "It has a bright future." Editor’s note: An earlier version of this story incorrectly said Acton Ostry, working with StructureCraft, designed an 18-storey residence at UBC. In fact, Acton Ostry worked with Fast + Epp as the structural engineers for this project. This version has been updated.